Whew, the cold weather is back again! If you read yesterday’s post, you already know that we have a doozie of a week happening, with a big snowfall yesterday (total of over 8 inches at my home) and some bitter cold temperatures coming. This resulted in us wrapping the coop with a tarp again to protect the birds from the wind that may come in through my less-than-windproof coop. Speaking of that, my aunt brought up a good question the other day. She can recall growing up not having to do anything special for the chickens in the winter, and I can’t remember my grandpa doing anything special with his henhouse. So why is it I feel I have to? Basically it boils down to this: I am not worried about them surviving the cold. There is plenty of chickens that make it even in -30 degree weather, but you do have to worry about frostbite. 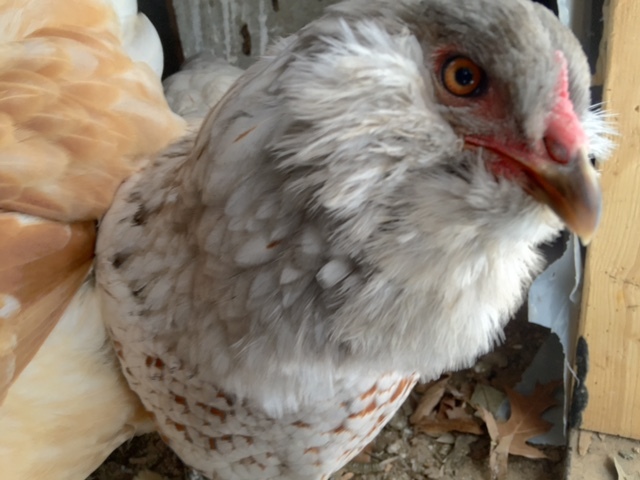 My Easter Eggers have no waddles or combs to speak of, so I don’t worry about them, but the Rhode Island Reds have waddles and combs that are a larger and more susceptible to frostbite. They would survive, no doubt, but it is introducing a possible health issue which I don’t want to have to deal with if I can avoid it. The answer is this: keep the wind and moisture down. 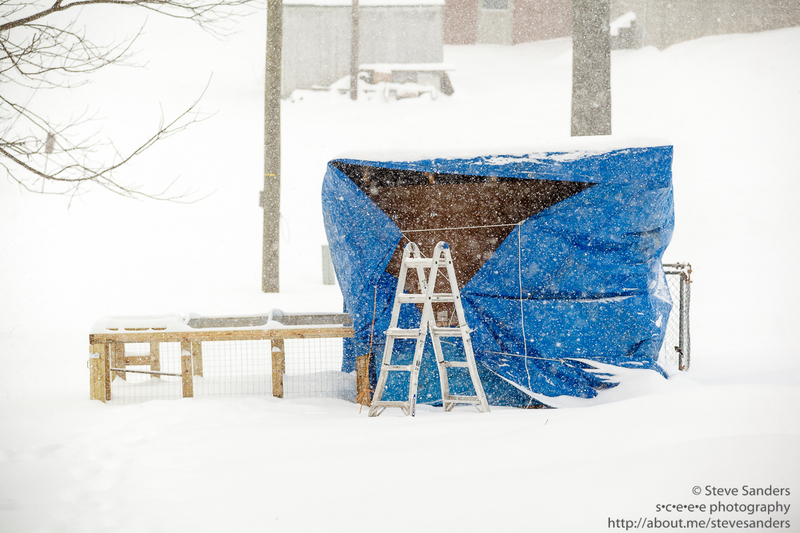 Fortunately I have good ventilation in my coop, perhaps too much, which is why I choose to insulate it further with a tarp for the bitter cold: to keep the possible drafts in the coop to a minimum. 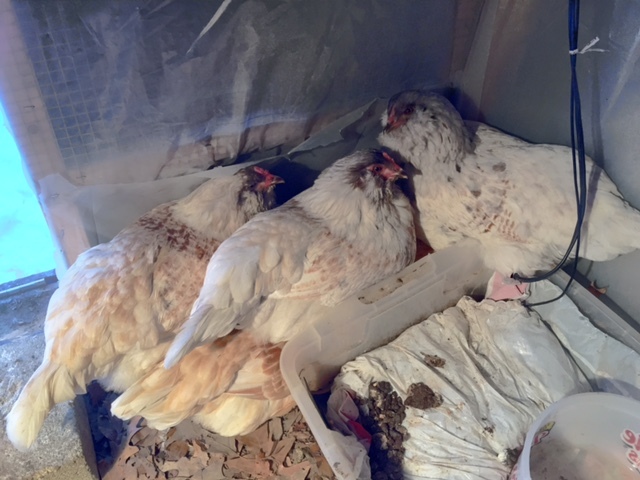 So far our hens haven’t suffered any frostbite that I can see, so I will continue doing this when temperatures are down in the single digits. Covering the coop this week will probably result in a decrease in the Easter Eggers egg laying. In fact, their egg production has gone down this week, though I think they laid during the middle of the night twice this week, which ended up meaning the eggs broke and hens ate them. That could have added 3-4 more eggs to the list, which would put in more in line with the normal production. 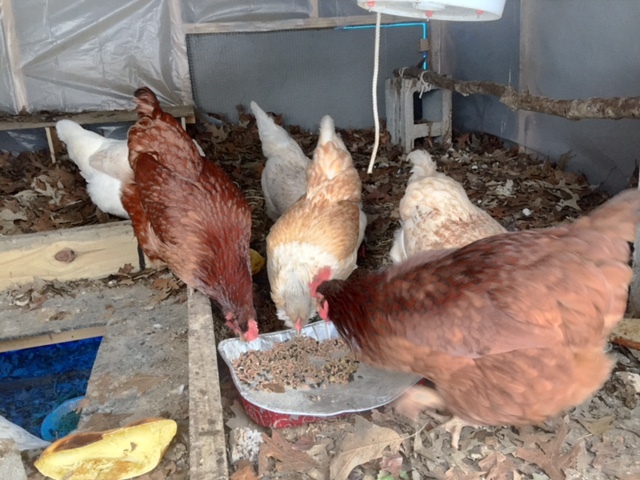 This week the totals were as follows: 22 Rhode Island Red eggs and 13 Easter Eggers, an increase of two for the Reds, and a decrease of six for the Easter Eggers. I was surprised that none of the hens ventured out into the snow yesterday, or at least not that we saw. I did see what might have been footprints in the snow, but it had already snowed enough more that I couldn’t tell for sure. They didn’t stay in the coop either, but they did stay in the part of the chicken run right under their hen house, rather than venturing out into the new northern extension. I don’t mind a good snow like this once a winter, but I do wish it weren’t accompanied by the terribly cold temperatures. We are now expecting -8 F later this week, which is very cold for our part of the country. So cold, in fact, there are numerous warnings going out to folks in preparation for the possibility of busted pipes. In short, this is not something our infrastructure is really built to handle. Praise God it is just a day or two, right? Just in case you are interested, I did take some pictures of some of the song birds eating on our deck rail yesterday. I am particularly fond of the Cardinals, how about you?